The American holly tree (Ilex opaca) is an evergreen species renowned for its leaves and berries, which often wind up in Christmas decorations. The holly tree is native to the United States, from as far north as Massachusetts southward to the middle of Florida and westward to Texas and southeastern Oklahoma. The holly tree is an important food source for birds and mammals that consume its seeds and the holly tree produces wood that artisans employ in cabinetwork and tool handles. 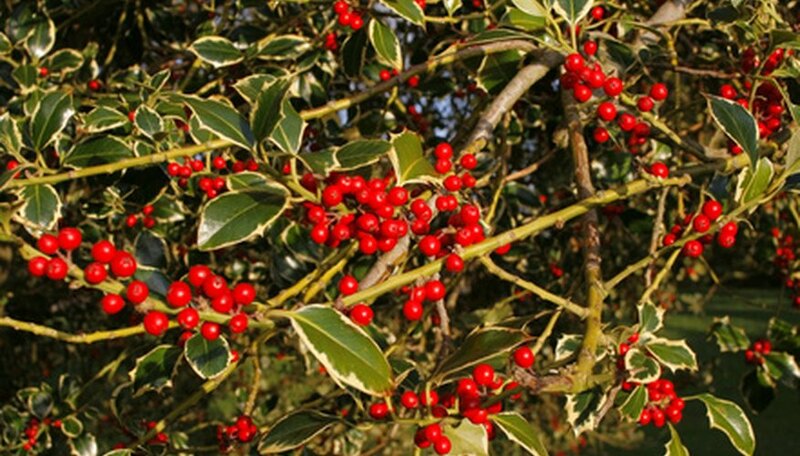 Identify the holly tree from many of its outstanding features. Look for a small tree in terms of height. The holly tree rarely grows taller than 50 feet high, with many of the landscaping cultivars in the range of 15 to 30 feet. The trunk of the holly tree is as wide as 1 to 2 feet. Examine the small holly leaves. Holly leaves develop alternate on the twig and grow to about 3 1/2 to 4 inches long and 2 inches wide. Notice the sharp spines on the stiff leaves. The colors of holly leaves are a dark green on the upper surface and a green-yellow shade on the bottom surface. Study the male and female flowers of the holly tree. Holly trees are dioecious, with male and female flowers on separate trees. This means that for the female holly tree to develop berries, a male tree must be close by for pollination purposes. According to Floridata, the flowers are a creamy white color and possess from four to six petals. Male flowers grow in clusters of between three and nine flowers; the female flowers exist in cluster no greater than three. Inspect the tree for the red berries they produce. The berries emerge only on the female trees and grow on a short stalk. The berries can be as wide as three-eighths of an inch and they will ripen by October. Look in the winter months and you may find holly berries still on the tree if the birds and other wildlife have failed to notice them. Observe the bark on a holly tree. The bark is typically a gray to reddish-brown color and stays smooth on the tree unless the specimen is old, according to the University of Connecticut Plant Database.